The haddock (Melanogrammus aeglefinus) is a common fish in the North Atlantic and is fished commercially. It’s readily available in supermarkets and may be sold fresh or frozen. 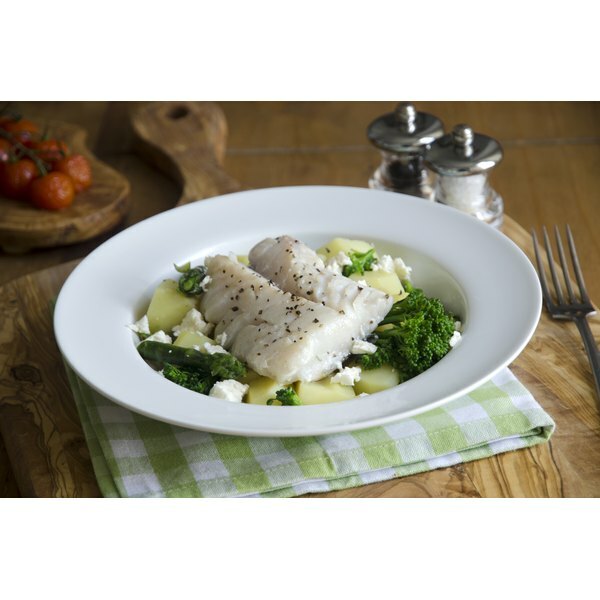 Haddock is a good source of protein and is very low in fat. It’s also high in vitamin B12, vitamin B6 and selenium. The nutritional content for haddock depends primarily on its preparation method. This nutritional information assumes the haddock is baked and contains no added ingredients. The serving size is a single fillet weighing 150g, or about 5.3 oz. A serving of haddock has a total of 168 calories. Protein provides 155 calories and fat provides about 13 calories. Haddock doesn’t contain a significant amount of carbohydrates. A serving of haddock provides about 8.4 percent of the total calorie requirements for one day, assuming a daily diet of 2,000 calories. A serving of haddock contains 1.4g of total fat, which provides about 2 percent of the recommended daily value (DV) for total fat. Unsaturated fats contribute 1.1g and saturated fats account for the remaining 0.3g of fat. A serving of haddock provides about 1 percent of the DV for saturated fat. It also contains 111mg of cholesterol, which is about 37 percent of the DV for cholesterol. A serving of haddock contains 36.4g of protein, which is 73 percent of the DV for protein. A serving of haddock provides 35 percent of the DV for vitamin B12 and niacin. It also has 26 percent of the DV for vitamin B6 and 5 percent of the DV for folate. A serving of haddock has 4 percent of the DV for thiamin and riboflavin. A serving of haddock provides 87 percent of the DV for selenium, 36 percent of the DV for phosphorus and 19 percent of the DV for magnesium. It also has 17 percent of the DV for potassium, 11 percent of the DV iron and 6 percent of the DV for calcium. A serving of haddock provides 5 percent of the DV for sodium and zinc.